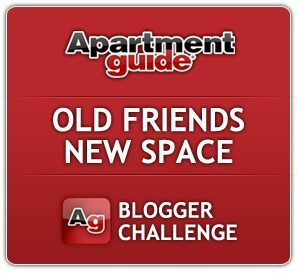 I mentioned last weekend that I am participating in Apartment Guide’s Old Friends New Space Blogger Challenge. 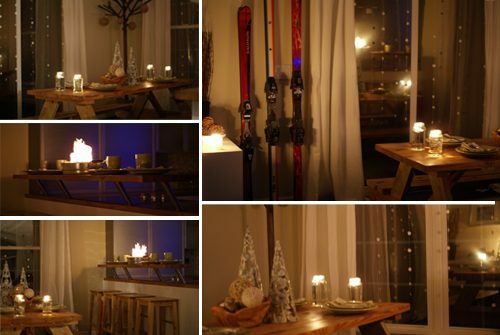 We decided on a ski lodge theme, and our initial intention was to do a family-friendly kind of theme, but the more we thought about it, the more we realized that lots of candles would add the perfect atmosphere, so we decided to make it an adult-only get together. You could certainly skip some of the lower candles for a more family-friendly theme, though. We found the beautiful wooden bowl for the table at Target, and it made the perfect centerpiece for our tablescape. The trees are from Willow Tree, and they’re marketed as Christmas decorations, but I love them so much that I’ve kept them up all winter. The jars are fettucine jars from my stash, filled with water, with votives floating in them. Apartment Guide isn’t just a resource for people looking to move. One of Apartment Guide’s goals is to show people how to entertain and make the most of small spaces. Our design really emphasizes that you can take simple pieces and put them together to make a cozy and elegant space to entertain. Nothing you see cost very much money, and our main living area isn’t huge by any standards, but it was really a very nice atmosphere once we were all done! 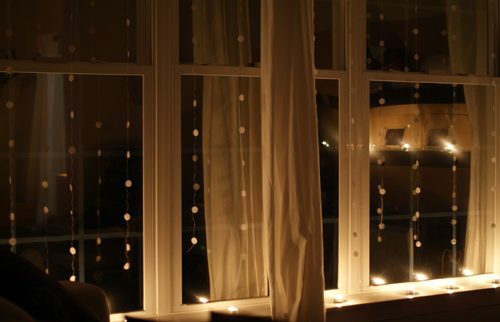 We first saw these snowflakes last year on Craftstylish, they were super simple to do but had such a big impact on the room! 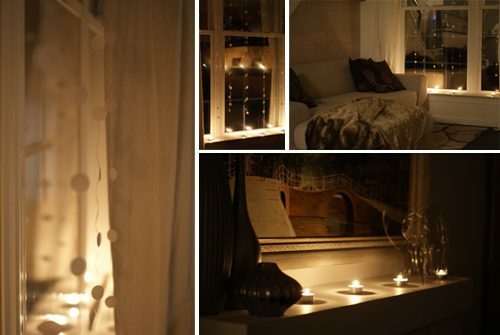 It took my husband maybe an hour to do all of the windows, and I especially love the way the candles make them glow. 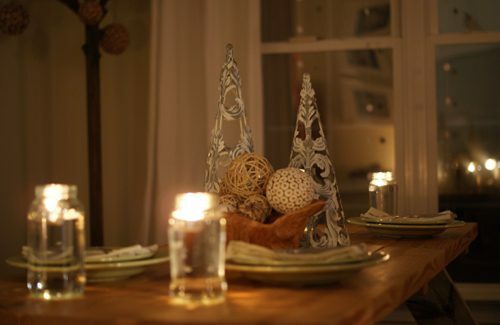 Overall, lots of candles, throw blankets and “snow” made for the perfect theme for a cold winter’s evening. Next week, I’ll show you our food choices. In the meantime, “like” Apartment Guide on Facebook or follow @aptguide on Twitter for real-time tips for making the most of your space! Apartment Guide is owned by Consumer Source, Inc. Apartment Guide partnered with bloggers such as me to participate in its “Old Friends, New Space” Blogger Challenge. As part of that program, I received compensation. They did not tell me what to purchase or what to say about the products used for the “Old Friends, New Space” Blogger Challenge. Apartment Guide and Consumer Source believe that consumers and bloggers are free to form their own opinions and share them in their own words. Consumer Source’s policies align with WOMMA Ethics Code, FTC guidelines and social media engagement recommendations. 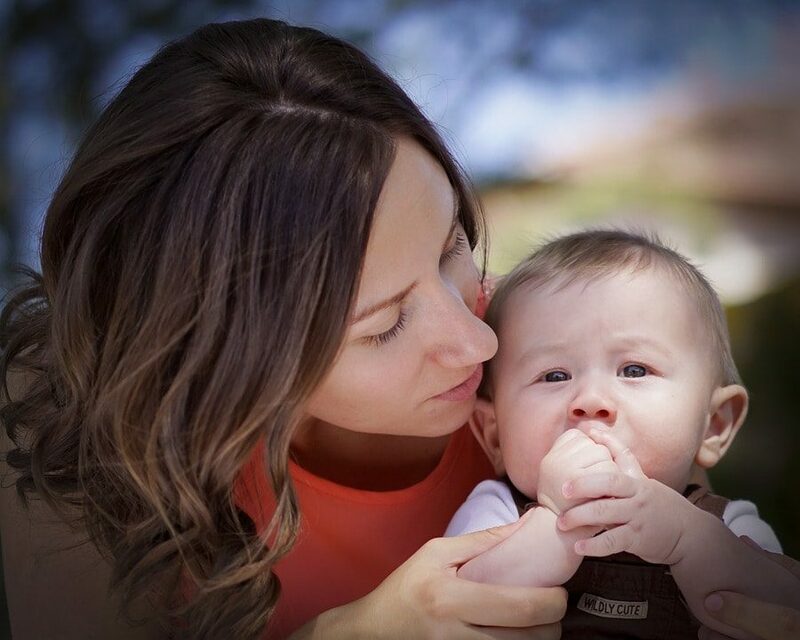 Next PostGiveaway: $100 Visa Gift Card from Cheep!